As a member or prospective member of this ministry of First United Methodist Church in Elgin, we want you to be fully aware of the importance of this organization to the worship vitality of our church. The Sanctuary Choir’ s mission is to enrich the worship experience with praise and devotion in song. We are the ministry through which the soul and spirit sings to God the Father in devotion and praise with song. We also assist the congregation in expressing our personal and communal love, adoration, faith, hope, fears and emotions. 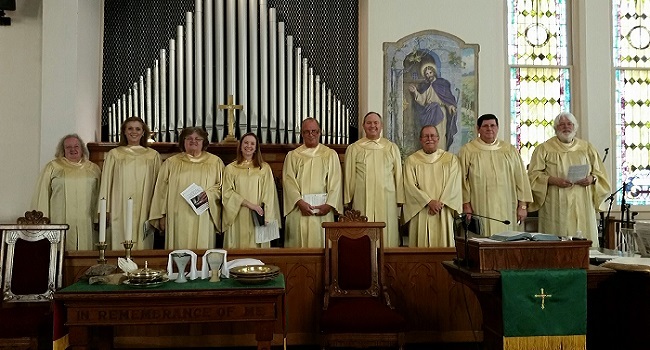 It is the purpose of the Sanctuary Choir to lead the musical worship of the 11:00 a.m. traditional-styled worship service each Sunday morning. The group provides leadership for the congregation on hymns and service music, and presents psalms and/or anthems. The Sanctuary Choir is always open to new members. No audition is required and the group has singers of all levels. The only pre-requisites are a love for great sacred music and for inspired reformed worship. However, previous choral experience and music reading ability is extremely helpful. If you are interested in becoming a member of this ministry, contact the church office at (512) 285-4503.